You may remember a couple of months ago we let you know about the Falling Walls competition, where innovative researchers and professionals compete to demonstrate the revolutionary power of their ideas in just 3 minutes. 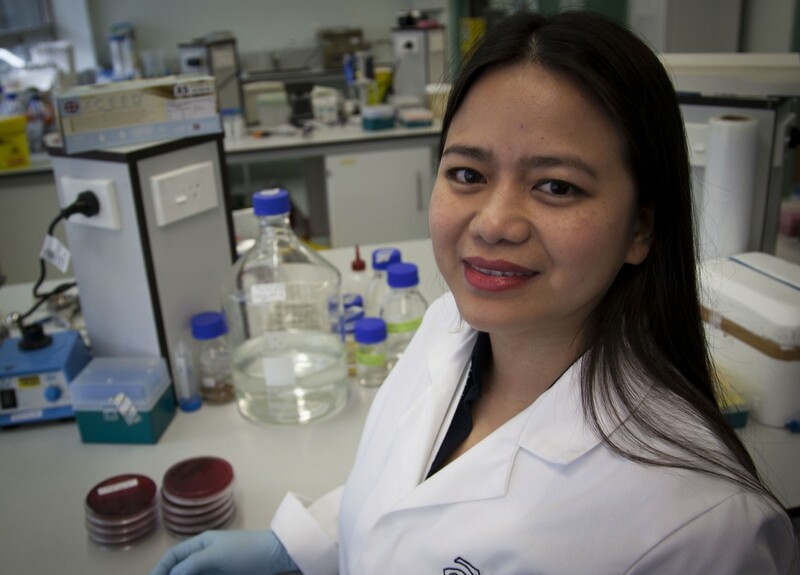 Only 5 New Zealanders have made the cut to go to the Australian finals in Canberra, and one of them is AUT doctoral candidate Stephanie-Anne Croft. Congratulations Stephanie-Anne! This isn’t the first time Stephanie-Anne has had international success pitching her research in 3 minutes. She was the AUT winner of 3MT in 2014, and at the Australian finals that year she made it all the way through to the last round. We caught up with her to find out the secrets to her success. Falling Walls is all about breaking down barriers with innovative new ideas. What are your ideas, and what barriers could they break down? My research project is developing a surface coating with antimicrobial functions. The application of it is for surgical implants, like orthopaedic implants, breast implants, basically any synthetic material that falls inside the body. People are living longer, so more people will be needing implants. A lot of problems associated with [implants] is infection. Currently there’s no technology available in clinical use to prevent infection, and to cure it. Our main goal is to prevent infection during surgery. How do you prepare for a presentation on the world stage? Taking part in the 3 Minute Thesis was a great experience, because it made me think about what I’m really wanting to say, and condense it in a way that makes sense – telling a story that’s clear, so everyone will get the point straight away. It helps to be passionate about your research, and believe in what you’re trying to achieve. When I started out in my PhD, we had a chance to visit Middlemore Hospital to actually see a hip replacement procedure, and meet a patient who had an infection. This man had been in hospital for three months without hips. That just made it real; you’re working towards something that has the potential to maybe change someone’s life. Research at this level is incredibly technical. How do you communicate it effectively to an audience of educated laypeople? Association helps a lot; telling it in a story form, having something to identify with. Working with bacteria, they’re so tiny – I associate it with, for example, when you don’t brush your teeth and you get that furry feeling. Don’t make it too complicated! Sometimes I think you lose your listeners if you start using technical jargon. How do you see these types of competitions factoring into your career plans? I think it’s a great podium to present your research to a broader audience, and also tell people what your capabilities are. Even for the university, it shows that we are doing world class research. It’s a great opportunity to connect with other people as well. I think being in research, you need to know a lot of people to collaborate with or to help you, and this is a great way to meet people from all sorts of different disciplines. What advice would you give to other postgrads who want to take their research to the world? Just say yes to opportunities! For me, I was working full-time in a diagnostic lab before I started my PhD, and I decided that I would say yes to everything. I thought: my PhD is only going to happen once. If I can, I’ll just say ‘OK, yes!’ It’s opened these doors that I normally wouldn’t get into if I didn’t actively pursue them. I think, as a researcher, it’s crucial that you communicate what you’re doing. The more people know about it, they more they get excited, and the more they get behind it. Stephanie-Anne will travel to Canberra for the Falling Walls Australia finals with support from the Royal Society of New Zealand, the German Embassy, and AUT Engineering. She will compete for a place in the international finals of the Falling Walls competition in Berlin. What a great story, best wishes Stephanie-Anne for a successful competition. Thanks Anaise for the interview.